Background: In preterm infants, immediate complications of surgical closure of a patent ductus arteriosus (PDA) are often serious and due to haemorrhage or ligation of incorrect structures. The aim of this study was to measure blood pressure (BP) changes during ligation and hence introduce a novel physiological marker to alert surgeons to the ligation of incorrect structures. Materials and Methods: This study included 146 preterm babies (≤35 weeks of gestation) who underwent surgical PDA closure of a left-to-right unidirectional PDA between June 2006 and December 2015. The median weight was 920 g (range, from 520 to 2200 g). In all cases, the PDA was test cross-clamped, and the lower limb or umbilical artery BP was recorded before ligation. Results: Based on preoperative echocardiography, the PDA diameter range was 2-4 mm in 135 cases and 5-6 mm in 11 cases. 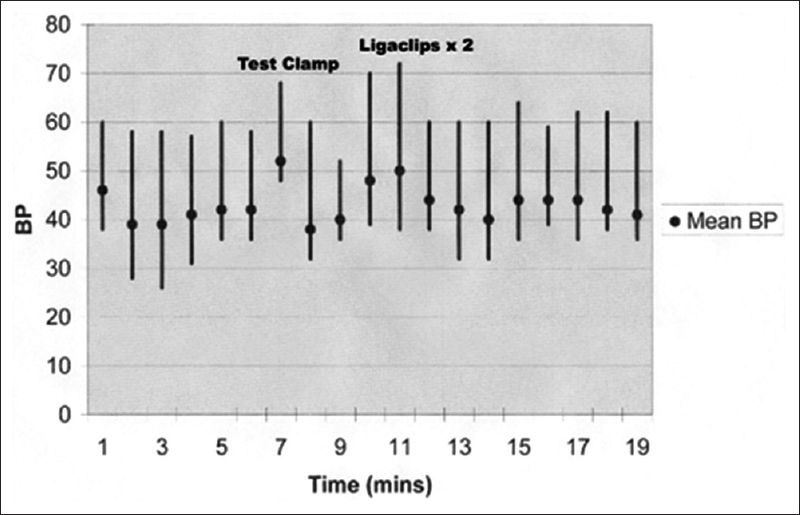 During test clamping of the PDA, a 20-60% rise in mean BP was recorded. The lower figure was observed with smaller PDAs. Conclusion: It is estimated that the mean BP should rise by 10% for every mm of PDA diameter during test clamping and ligation of the PDA, irrespective of weight or age. The absence of this expected rise in mean BP indicates that an incorrect structure might have been clamped. Background: The aim of the study was to evaluate the outcomes of initial surgical procedures for oesophageal atresia at our institution. Primary repair of oesophageal atresia at our centre was perceived to be associated with a high mortality rate. In view of this, almost all patients seen since January 2014 were offered initial surgery for staged repair. Materials and Methods: A retrospective review of records of infants with oesophageal atresia seen at the centre from January 2007 to December 2014 was used in this study. Results: Eighty-five cases of oesophageal atresia were seen over the study period. Of these, 74 (87.1) had surgery performed. Surgical outcome was, however, indicated in 67 of the 74, with overall survival rate of 40.3%. Among the 67 patients, early primary repair was performed in 24 (35.8%) with a survival rate of 45.8% (11 patients). Totally, 12 (17.9%) of the 67 had initial procedure for delayed primary repair, with a survival rate of 16.7% (2 patients). The remaining 31 (46.3%) patients had initial surgery for staged repair, with survival rate of 45.2% (14 patients). There was no association between the type of surgery and the surgical outcome (χ2 = 3.396, df = 2, P = 0.183). Conclusion: The overall surgical survival rate of 40.3% for oesophageal atresia at our institution is low. This study did not show any difference in the survival rate of 45.8% and 45.2% associated with primary repair and staged repair respectively. Background: Neonatal pneumoperitoneum is attributed, in most of the reported cases, to necrotising enterocolitis (NEC). There are also other causes leading to free intraperitoneal air. The aim of this study is to describe the clinical spectrum, causes, management and outcome of neonates admitted with pneumoperitoneum in the paediatric surgery unit of a university hospital. Subjects and Methods: This retrospective study included neonates having radiographic evidences of pneumoperitoneum from 2012 to the end of 2014. Patients' files were analysed regarding age at admission, birth weight, history, clinical picture, management, operative findings and subsequent outcome. Results: Fifty-six out of 379 neonates (14.7%) were found to have pneumoperitoneum during the study period. There were 35 males (62.5%) and 21 females (37.5%). Cases diagnosed as NEC represented 27 neonates (48.2%). There were 29 cases (51.8%) with causes not related to NEC. Non-NEC causes were spontaneous intestinal perforation (8.9%), ano-rectal malformations (7.1%), Hirschsprung's disease (14.2%), ileal atresia (3.5%), incarcerated inguinal hernia (1.7%), gastric perforation (1.7%) and meconium ileus (1.7%). In seven patients (12.5%), those who were managed conservatively (8.9%) or whose laparotomy was negative (3.6%), no cause of pneumoperitoneum could be reached. Overall mortality was 25%, 78.5% of which was NEC-related. Conclusions: Neonatal pneumoperitoneum is an alerting finding for paediatric surgeons. Most cases imply serious causes with a significant morbidity and mortality, NEC being the most common cause. On the other hand, pneumoperitoneum is not an absolute indication for surgery. Careful assessment and tailored management can limit the morbidity of unnecessary laparotomies. Background: The skeletal changes in McCune-Albright disease are usually severe because of the polyostotic form of the disease. Trendelenberg gait and limited mobility are the most common presenting features. The constellation of Café-au lait spots and polyostotic bone involvement is commonly referred to as McCune-Albright's syndrome (MAS). Materials and Methods: One boy and 4 girls (7-16 years) were sought in our departments from 1998 to 2012. Limb length discrepancy was the main clinical presentation. Repetitive micro-fractures caused the development of 'Shepherd crook' deformity with pain were the main burden. Results: Because of the repetitive micro-fractures and the significant deformity that distorted the integrity of the long bones which were associated with pain. We referred to re-alignment valgus osteotomy with internal fixation to preserve proper alignment. Moreover, guided growth technique with 8-plates was performed in 1 case. Conclusion: Tendency to progressive unilateral lower limb deformity in patients with MAS is usually associated with thinning and expansion of the cortex and distortion of the normal lower limb integrity secondary to repetitive micro-fractures. The latter is a situation which warrants surgical treatment to re-align the deformity and to preserve function. Prophylactic intramedullary nailing via the application of locking nails to ensure stabilisation of the femoral neck was found to be effective. However, nevertheless, the mosaic nature of MAS means any cell, tissue and organ in any site of the body could be affected to varying degrees. The clinical manifestations are a diversity of the disorder ranging from mild clinical signs to severe life-threatening disease. Background: Stool colour assessment is a screening method for biliary tract obstruction in infants. This study is aimed to be a proof of concept work of digital photograph image analysis of stool colour compared to colour grading by a colour card, and the stool bilirubin level test. Materials and Methods: The total bilirubin (TB) level contents in stool samples from 17 infants aged less than 1 year, seven with confirmed cholestatic jaundice and ten healthy subjects was measured, and outcome correlated with the physical colour of the stool. Results: The seven infants with cholestasis included 6 cases of biliary atresia and 1 case of pancreatic mass. All pre-operative stool samples in these cases were indicated as grade 1 on the stool card (stool colour in healthy infants ranges from 4 to 6). The average stool TB in the pale stool group was 43.07 μg/g compared to 101.78 μg/g in the non-pale stool group. 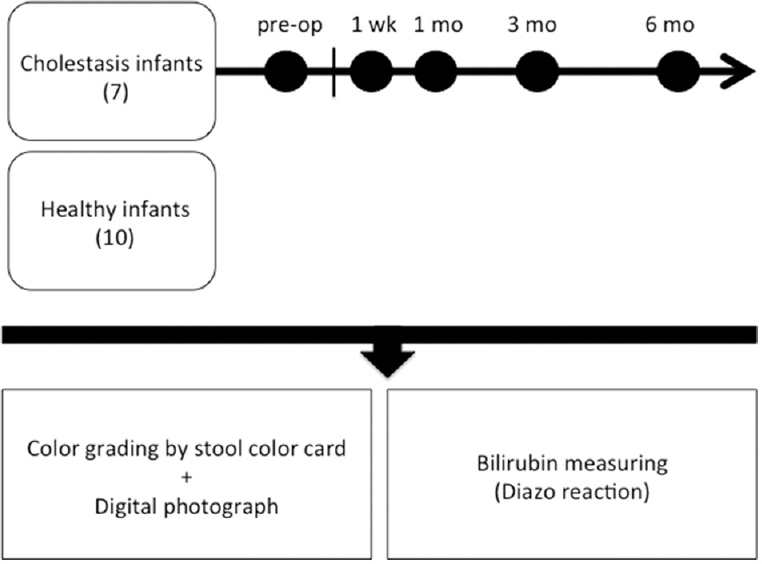 Of the 3 colour channels assessed in the digital photographs, the blue and green light were best able to discriminate accurately between the pre-operative stool samples from infants with cholestasis and the samples from the healthy controls. With red, green, and blue (RGB) image analysis using wave level as the ANN input, the system predicts the stool TB with a relationship coefficient of 0.96, compared to 0.61 when stool colour card grading was used. Conclusion: Input from digital camera images of stool had a higher predictive capability compared to the standard stool colour card, indicating using digital photographs may be a useful tool for detection of cholestasis in infants. Background: Gynecomastia is defined as benign proliferation of male breast glandular tissue. To date, the pathophysiology of adolescent gynecomastia (AG) remains unclear. Kisspeptin is a polypeptide that plays an important role in the regulation of the hypothalamic-pituitary-gonadal hormonal axis. In this study, we investigated whether there is a relationship between kisspeptin and AG. Materials and Methods: This study included 40 males between 9 and 18 years of age diagnosed with gynecomastia. The control group consisted of 30 young healthy males in the same age range. The participants were evaluated with respect to anthropometric measurements (age, height, body weight, body mass index, breast and pubic stages and testicular volume). The levels of kisspeptin, follicle-stimulating hormone, luteinizing hormone, estradiol (E2), testosterone (T), and ratio of E2 to T were measured in both groups. Results: The mean age was 13.8 years. There were no differences between the groups in terms of anthropometric parameters, plasma gonadotropin levels, estrogen levels, and E2/T (P > 0.05). Plasma kisspeptin (0.77 and 0.54 ng/mL, P < 0.05) and T (253.9 ng/dL and 117.9 ng/dL) levels were significantly higher in the AG group than in the control group (P < 0.001). Conclusion: Kisspeptin levels are an important factor in AG. Background: This was a comparative randomised study to find out the value of using loupe magnification and methylene blue dye in identification of the thyroglossal duct and to compare between them. 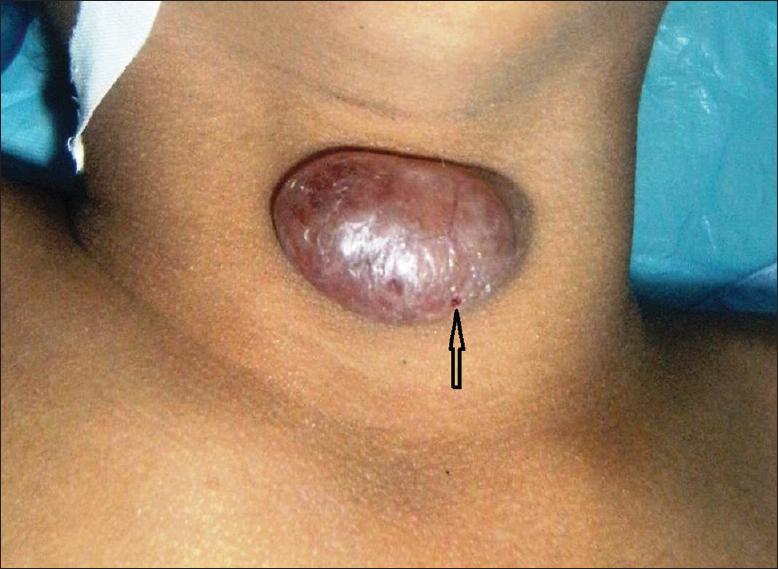 Patients and Methods: Twenty-two patients who presented with infrahyoid thyroglossal duct cyst were subjected to excision of the cyst with two methods for identification of thyroglossal duct track during the operation. Data were anlysed for identification of multiple tracts, the tract relation to the hyoid bone, incidence of complications and operative time. Results: We found that multiple tracts were present in 9.1% of the patients in Group I and 36.3% in Group II, with no statistically significant difference between the two groups. The incidence of complications was 27.2% in Group I and 9.1% in Group II, with no statistically significant difference between both groups. However, the incidence of identification of the tract, and its relation to the hyoid bone was higher in Group II (90.9%) than in Group I (45.5%) , with a statistically significant difference between both groups. Also the incidence of identification of the extension level of the tract above the hyoid bone and up to the tongue base was significantly higher in Group II (72.8%) as compared to Group I (9.1%). The operative time was significantly shorter in Group II (54.35 min) and was 76.55 min in Group I, (P = 0.0001). Conclusion: Intra-operative identification of the thyroglossal tract is an essential step in the removal of the thyroglossal duct cyst. Both loupe magnification and methylene blue dye help in the tract identification, however, the usage of surgical loupes enhances better and safe results. Mixed gonadal dysgenesis is characterised by unilateral chromosomal abnormality, which is probably the result of anaphase lag during mitosis. The 45, XO/46, XY karyotype is the most common form of mosaicism involving the Y chromosome. It is a rare clinical entity with a worldwide incidence of 1.5/10,000 live births. Its epidemiology in Sub-Saharan Africa is not known. 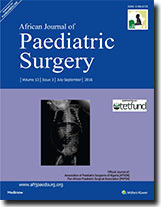 This study reports experience in the management of 3 cases at the Yaounde Gynecologic-Obstetric and Paediatric Hospital. From November 2009 to November 2014, 3 cases were successfully managed at our institution. 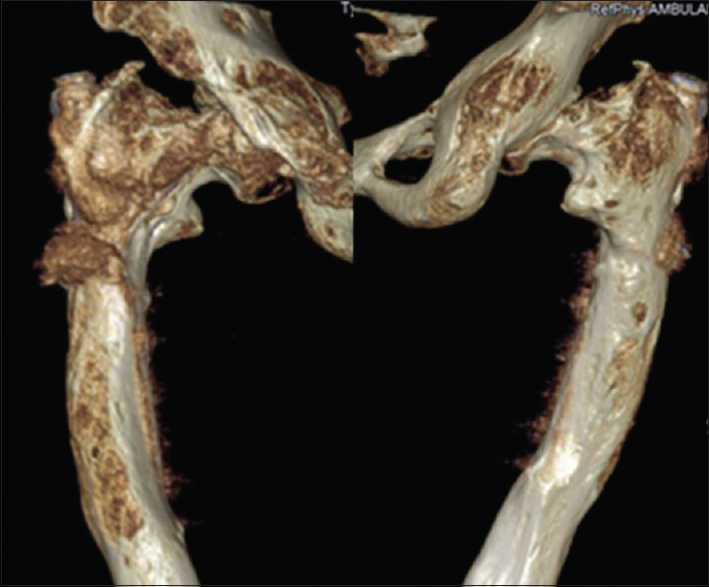 Results: All patients presented with asymmetrical gonadal differentiation. On one side of the body, a poorly-developed testicular gonad and on the other side a gonadal streak. A persistent Mόllerian remnant was equally found in the 3 cases. Management of mixed gonadal dysgenesis should be done in tertiary health care centres. A multidisciplinary team approach is recommended. Meckel's diverticulum (MD) is the most common congenital anomaly of the gastrointestinal tract. Most often is asymptomatic but it may give a number of complications including gastrointestinal bleeding, obstruction and inflammation. Axial torsion and gangrene of MD are exceptional. The correct diagnosis of MD could only be made during surgery. Early surgery is important to reduce morbidity, especially perforation. Laparoscopy aided in the diagnosis and adequate treatment. We herein describe the case of a 4-year-old boy with axial torsion of MD. Clinical and radiographic finding suggest a segmental volvulus. 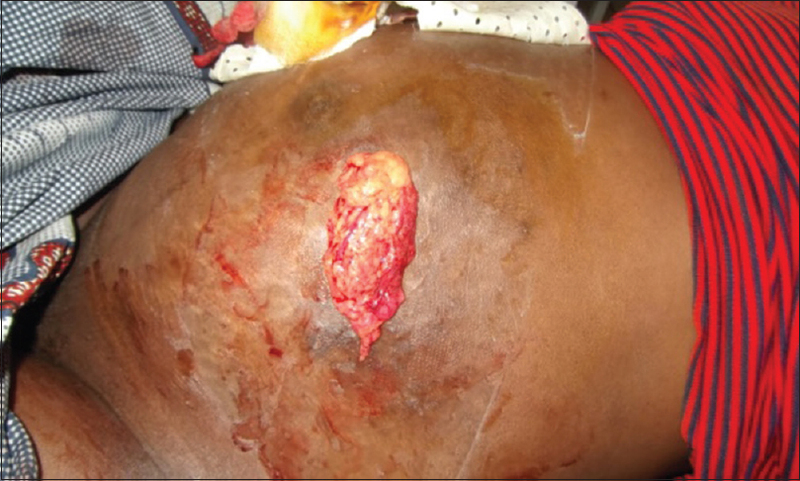 Laparoscopy contributes to diagnosis and treatment of torted MD. Syringocele or dilatation of the duct of the bulbo-urethral (Cowper's) gland is usually of congenital origin but can be acquired. It is a very rare deformity, <10 cases have been reported in literature. The main objective is to describe an additional case of syringocele of Cowper's glands and review the literature. 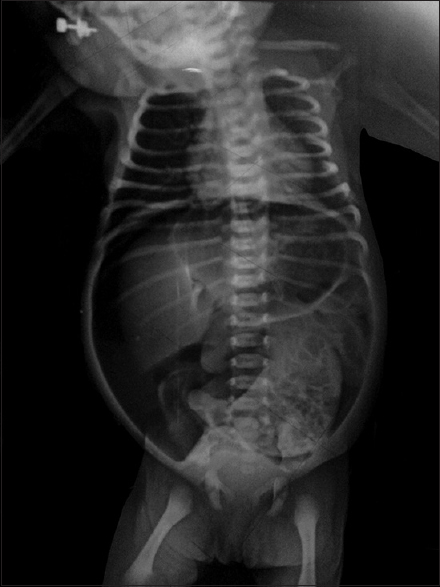 An 18-month-old infant presented with a history of acute urinary retention 3 days after birth and a cystostomy was done. Voiding cystourethrogram was normal and cystourethroscopy showed a syringocele. 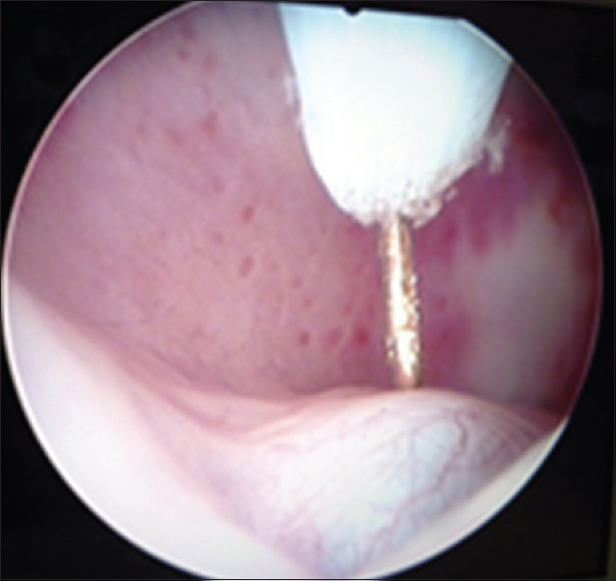 Endoscopic incision was performed in our patient with satisfactory results. No complications were noted. Syringocele or cystic dilatation of Cowper's gland duct usually has a congenital aetiology. Diagnosis is confirmed by endoscopy. Treatment is by marsupialisation in the urethra by endoscopy. Syringocele is a rare pathology usually congenital. It should be suspected in all case of lower urinary tract obstruction in children. Traumas of the foetus caused by stabbings are rare but actually life-threatening for both the foetus and the mother. We report a case of penetrating chest wound on a baby taken from the obstetrics unit to the paediatric surgical department. His mother was assaulted by his father, a mentally sick person with no appropriate follow-up. The foetus did not show any sign of vital distress. Surgical exploration of the wound has revealed a section of the 10 th rib, a laceration of the pleura and a tearing of the diaphragm. A phrenorraphy and a pleural drainage were performed. The new-born and its mother were released from hospital after 5 days and the clinical control and X-ray checks 6 months later showed nothing abnormal. We insisted a medical, psychiatric follow-up be initiated for the father. As regards pregnant women with penetrating wounds, the mortality rate of the foetus is 80%. The odds are good for our newborn due to the mild injuries and good professional collaboration of the medical staff. Penetrating transuterine wounds of the foetus can be very serious. The health care needed should include many fields due to the mother and the foetus' lesions extreme polymorphism. In our case, it could have prevented by a good psychiatric followed up of the offender.